DAVID ZLUTNICK, PRODUCER: Over the past three seasons, as the San Francisco Giants won two World Series championships, concession workers at the team’s home of AT&T Park have been working without a contract. 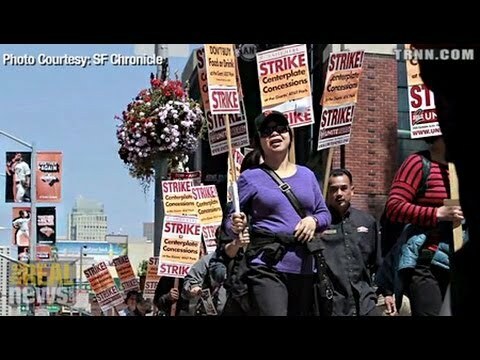 In May, workers voted 97 percent in favor of authorizing a strike against Centerplate, the Giants’ concession contractor. On May 25, as negotiations between their union, Unite Here Local 2, and Centerplate came to a standstill, around 750 concession workers held a one-day strike to echo their demands: job security, health benefits, and a wage increase. Billie Feliciano has worked with the Giants for 27 seasons and says that despite past labor disputes, negotiations have never been this contentious. BILLIE FELICIANO, CONCESSION WORKER: But in the whole history that I’ve been here, we’ve never had to go to these lengths for contracts. ZLUTNICK: Since 2010, over 10 million fans have purchased tickets at AT&T Park, which now holds the record of most consecutive sellouts at any baseball stadium. And the average ticket price has gone up by 20 percent. Individual concession stands bring in tens of thousands of dollars each, such as the one managed by Zenaida Cruz, who’s been with the Giants for 19 seasons. ZENAIDA CRUZ, CONCESSION WORKER: They’re never below 18,000. So we go all the way, about 26,000, 27,000, especially when the Dodgers is here. ZLUTNICK: With around three dozen stands across the park, that’s hundreds of thousands of dollars per game. This has contributed to a 14 percent increase in team revenue, according to Forbes, bringing the total value of the San Francisco Giants to $786 million. All the while, concession workers have seen a three-year wage freeze. The average concession worker at AT&T Park currently makes only $11,000 per year in a city with one of the highest costs of living in the country. CRUZ: Centerplate’s saying that we are the highest paid in the city, but we live in San Francisco. ZLUTNICK: In response to demands for a wage increase, Centerplate has offered only $0.25 per hour and to maintain the current wage freeze. Managers do get slightly more than other workers, but even when the Giants make the playoffs, annual income is low. FELICIANO: The manager could make on a good season $18,000, but believe me, no more than that. ZLUTNICK: Of course, ballpark workers only work during baseball season, meaning that for roughly half the year they have no steady employment. Tied to this is health care, which workers do not receive at all between seasons. While workers want health care to improve, Centerplate wants to increase the number of games one must work per month to qualify, putting it further out of reach. The instability of the work is also an issue. When the contract between the Giants and Centerplate expires, the jobs and their terms are far from guaranteed. FELICIANO: For the future, for people coming, like my son who’s working, like these grandchildren, they want to work there. They have to know, if they come there, they have a job. ZLUTNICK: Centerplate, which is based in South Carolina, is one of the largest concession contractors in the country. They have held the Giants contract at AT&T Park since the stadium was built. The company says it does not make enough profit off its contract with the Giants to meet the workers’ demands. According to Unite Here, Centerplate pays 55 percent of profits at its stands directly to the Giants, meaning the contractor covers all its expenses, including labor, from the remaining 45 percent. Union organizer Julia Wong says this is part of the problem. JULIA WONG, UNITE HERE LOCAL 2: And since Centerplate is getting squeezed, we’re seeing that squeeze being forced onto the workers. The prices of the food and of the beer have gone up, and, you know, that’s just–it’s not being passed on to the people that actually do the work. DAVE ZIRIN, SPORTS CORRESPONDENT, THE NATION: The way that these subcontractors work is what they do is they give ownership plausible deniability. ZLUTNICK: Dave Zirin is sports editor for The Nation magazine, writing on the intersection of sports and politics. ZIRIN: Like, take the case in San Francisco. The workers, you know, they haven’t gotten a raise, and here is Centerplate telling them, no, you’re not going to see an extra dime, and here is ownership saying, we have no responsibility. And it really is laughable, the idea that they couldn’t influence Centerplate, that they wouldn’t be able to weigh in with Centerplate. But what it does is it allows them to remove themselves from the equation. ZLUTNICK: While this may seem like a labor dispute between workers and their private employers, both Zirin and Wong point out that the Giants, and therefore Centerplate, have benefited extensively from public contributions. Although AT&T Park is one of the few stadiums not constructed from public subsidies due to their rejection by San Francisco voters, the Giants did receive some of the most valuable land in the country from the city at no cost. San Francisco also added infrastructure improvements worth $80 million and continues to contribute city services. The Giants have argued that any public support it receives is beneficial for the city by providing jobs. WONG: Whenever a stadium is built, whenever there’s any new development, it’s trumpeted that this is a job creator, this is so great, it’s a job creator. But what kind of jobs are being created? If we’re fighting so hard just to have health care for six months out of the year, you know, what does that really say about where the priorities in this region are? ZLUTNICK: Owners of professional sports teams have seen the benefit of almost $20 billion in taxpayer subsidies for stadiums since 1990, even though studies have shown that in almost every case there is either no measurable economic impact or a negative economic impact on their home cities. ZIRIN: In some states, when you have a public works project, your workers are subject to living wage laws. In any other situation, if $1 billion was going to build something in a city, that would be a public works project. When it comes to sports, it’s not a public works project; it’s corporate welfare. ZLUTNICK: On June 18, dozens of workers and their supporters sat down in front of a concessions stand inside AT&T Park and blocked it from operating. Eventually, ten protesters were arrested, while outside hundreds picketed in support of the workers’ demands. A boycott has also been called by the union, not against going to Giants games, but against buying concessions. CRUZ: A lot of fans really support us. You know? People, when we have the strike, we kept saying, enjoy the game, but don’t buy the food. And some people say, yes, I bring my food today. ZLUTNICK: Centerplate, however, maintains that the workers’ demands are unreasonable. Spokesman Sam Singer told The San Francisco Chronicle back in May that the company values its employees, which is why they’re already the highest-paid staff in the concession business, receiving full health care and other benefits for their part-time work. WONG: These workers make $11,000 a year on average. Many of these workers are living in low-income subsidized housing. If these are the best-paid concession workers in the country, that is not something to be bragging about. ZIRIN: I think the Giants case, that’s what makes it so highly symbolic, because you have this historically working-class pastime in a city that’s–more and more workers are being pushed out, and then the workers themselves in this traditionally little liberal community are asking for help, are asking for support. And we’ll see whether or not that happens. ZLUTNICK: As the economy continues to shift toward the service sector, the Giants concession workers are the latest in a number of developing campaigns that have included Walmart workers and fast food workers, among others, seeking to raise the level of respect and compensation for service workers across the country. WONG: Workers are rejecting the premise that they’re not worth anything, that anybody can do their job, that they don’t have value, by standing up, by going on strike, by speaking out, by demanding basic respect and dignity. CRUZ: I hope the CEOs, whoever, Centerplate, whether they’re in South Carolina or Connecticut and they’re businessmen or women, that they understand this. We’re fighting for our jobs. If we don’t make money, they don’t make money. ZLUTNICK: This is David Zlutnick in San Francisco, California, for The Real News Network.